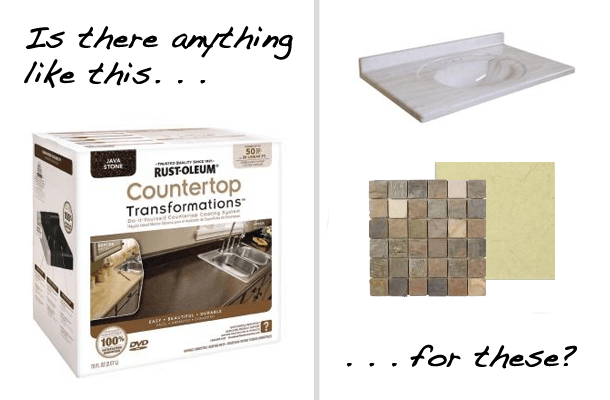 Can You Paint Cultured Marble Or Tile Countertops? Mary, unfortunately neither one of those surfaces handle paint well in wet areas. This is one of the reasons why it’s not recommended to use a product like Rust-Oleum CountertropTransformations on cultured marble or tile. Upon receiving your question, I asked all my contacts in the painting industry for help and I also scoured the internet to find a paint for a DIY makeover on a cultured marble countertop. Unfortunately, short of buffing and reapplying a gel coat to get it back to its former glory, there really isn’t much you can do yourself to give a cultured marble countertop a new look. In fact, when it comes to making over cultured marble you really have only three options: live with it, replace it or hire a company to come in and professionally refinish it. The first option is pretty self-explanatory, do nothing and live with the countertop you’ve already got. Not the most glamours option, but it’s certainly the cheapest. 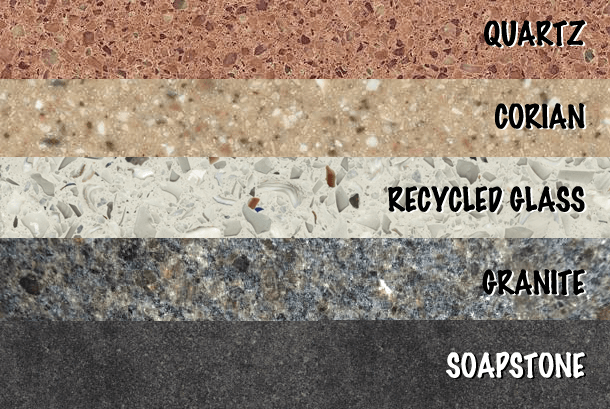 The second option requires you to choose a new countertop and install it yourself, or hire someone else to install it for you. Depending on the size of your countertop, you might be able to find a pretty cheap replacement at a home improvement store. If you go this route and decided to do it yourself, be aware that you are also going to have to deal with the plumbing attached to the sink and faucet as well. After all, it’s not just the countertop that has to be removed and replaced. The last option is to hire a company to professionally refinish it for you. This is done very similarly to how you would have a bathtub or shower refinished, which is why it’s best to have someone else do the work for you. To date, none of the attempts I’ve seen by DIYer’s have turned out very well. It’s also important to mention that if you are going to have this done, it may be more cost-effective in the long run to just replace the countertop. These finishes can last for awhile, but eventually may chip and crack. At which point, you’d be back to square one. Which brings us back to option two – replace it. As for a tile countertop, if the tiles are well secured, just about the only thing you can do that will last is to put a new tile right over the existing ones. However, this poses a unique problem when it comes to the sink. Whether the sink is an under mount or a drop in sink, you’ll have to get creative with the new edge. In the case of an under mount sink, how will you treat the overlap of the tile onto the sink? It will now be twice as thick as it was before and if you leave it the way it is it, you’ll be able to see the edges of both layers of tile. So, you’ll have to find away to cover up the existing tile and make a finished looking edge at the same time. If the sink is a drop in, you’ll want to make sure that the additional tile with thinset isn’t too tall. You don’t want the tile to be taller than the sink. And then if the sink is round, you are going to have a lot of angled circular cuts to make. Which can be frustrating if you are not familiar with how to make those types of tile cuts. I wish I had better advice to give, but when it comes to cultured marble and tile countertops there really isn’t much you can do. My advice is to wait until you can replace them completely, as this is the only option that will be cost effective and long lasting. Do you have questions about the selecting or the installation of: tile, carpet or wall treatments (window blinds, etc)? Then email me your tale of woe (diva(at)homemakeoverdiva.com) and perhaps I will be able to answer your questions right here at the Home Makeover Diva Blog! Are In-Floor Heating Mats Worth It?